Samhan refers to the ancient confederacies of Mahan, Jinhan, and Byeonhan in central and southern Korean Peninsula, that eventually absorbed into two of the Three Kingdoms of Korea. This period generally constitutes a subdivision of the Three Kingdoms Period, historians also name the period the Proto-Three Kingdoms Period or the Samhan Period. Sam (三) means "three," and Han means "great" or "leader" in Korean. Han transliterates into Chinese characters 韓, 幹, or 刊, but distinctive from Han in Han Chinese and the Chinese kingdoms and dynasties also called Han (漢, 韓). The names of those confederacies reflect in the current name of South Korea, Daehan Minguk (literally, "Great Han People's Nation"). Historians believe Samhan formed around the time of the fall of Gojoseon in northern Korea in 108 B.C.E., when the state of Jin in southern Korea also disappeared from written records. By the fourth century, Mahan had fully absorbed into the Baekje kingdom, Jinhan into the Silla kingdom, and Byeonhan into the Gaya confederacy, all later annexed by Silla. The Samhan, loose confederations of walled-town states, each appear to have had a ruling elite, whose power mixed politics and shamanism. Although each state appears to have had its own ruler, no evidence exists of systematic succession. The name of the poorly understood Jin state continued to be used in the name of the Jinhan confederacy and in the name "Byeonjin," an alternate term for Byeonhan. In addition, for some time the leader of Mahan continued to call himself the King of Jin, asserting nominal overlordship over all of the Samhan confederations. Ancient Korea and Taihougun, in third century C.E. Mahan, the largest and earliest developed of the three confederacies, consisted of fifty-four minor statelets, one of which conquered or absorbed the others and became the center of the Baekje Kingdom. Historians generally believe Mahan located in the southwest of the Korean peninsula, covering Jeolla, Chungcheong, and portions of Gyeonggi. Mahan, a loose confederacy of chiefdoms that existed from around the first century B.C.E. to the third century C.E. in the southern Korean peninsula in the Chungcheong Province. Arising out of the confluence of Gojoseon migration and the Jin federation, Mahan constituted one of the Samhan (or "Three Hans"), along with Byeonhan and Jinhan. Baekje began as a member statelet, but later overtook all of Mahan and became one of the Three Kingdoms of Korea. Mahan probably developed from the existing bronze society of third to second centuries B.C.E., continuing to absorb migration from the north in subsequent centuries. King Jun of the kingdom of Gojoseon in northern Korea, having lost the throne to Wiman, fled to the state of Jin in southern Korea around 194-180 B.C.E. Historians believe that he and his followers established a base within Jin territory, where he called himself the Han King. Whether Mahan conquered or arose out of that entity remains in dispute, but that influx of northern culture certainly influenced Mahan. Hyeonmoo, Guardian of the North. 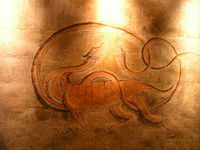 Paiting on ancient Korean tomb. Further migration followed the fall of Gojoseon and establishment of the Chinese commanderies in the northern part of the Korean peninsula in 108 B.C.E. The Chinese chronicle San Guo Zhi, and the much later Korean chronicles Samguk Yusa and Samguk Sagi, describe Mahan. Mahan kings originally called themselves "King of Jin," referring to the earlier Jin state and asserting nominal sovereignty over all of Samhan. A wealth of bronze artifacts and production facilities indicate that Mahan probably developed earliest among of the three Hans. At its height, Mahan covered much of the Han River Basin and the modern-day provinces of Gyeonggi, Chungcheong, and Jeolla, although political unity was strongest in Chungcheong, led by Mokji (목지국, 目支國). In the first and second centuries C.E., with the transition to iron culture, the focus of power shifted from Mokji to Baekje in the Han River region. Baekje eventually absorbed or conquered all of Mahan by the third century, growing into one of the Three Kingdoms of Korea, along with Silla and Goguryeo. Jinhan refers to a loose confederacy of chiefdoms that existed from around the first century B.C.E. to the fourth century C.E. in the southern Korean Peninsula, to the east of the Nakdong River valley, Gyeongsang Province. Jinhan constituted one of the Samhan (or "Three Hans"), along with Byeonhan and Mahan. Apparently descending from the Jin state of southern Korea, Silla, one of the Three Kingdoms of Korea later absorbed Jinhan. Jinhan consisted of twelve statelets. Jinhan, like the other Samhan confederacies, arose out of the confusion and migration following the fall of Gojoseon and establishment of the Chinese commanderies in the northern part of the Korean peninsula in 108 B.C.E. Although Jinhan's relation to the earlier state of Jin remains unclear, the contemporary Chinese chronicle San Guo Zhi considers Jinhan identical with Jin (while another record describes Jin as the predecessor of the Samhan as a whole). Jinhan and Byeonhan shared essentially the same culture, with varying religious customs, and apparently a poorly defined boundary. According to Korean records, Bak Hyeokgeose, who united the leading clans of Jinhan under his rule, founded the Silla Kingdom (around present-day Gyeongju) in 57 B.C.E. with sparse and conflicting records regarding the relationship between the names Jinhan, Saro, Seorabeol, and the later Silla kingdom, historians remained unclear about the development of Jinhan. We know little of the daily life of Jinhan people. The religion appears to have been shamanistic, and to have played an important role in politics as well. Rice, heavily dominated agriculture, which also included substantial rearing of livestock including horses, cattle, and chickens. 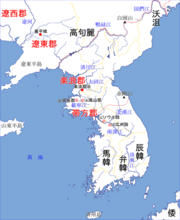 Most theories indicate that Jinhan located in the area later occupied by the Silla kingdom: the Gyeongju Basin and adjacent Sea of Japan (East Sea) coast. The Byeonhan confederacy would have bordered on the southwest, and by the much larger Mahan confederacy on the west. The northern border would have been the Chinese commanderies and the small coastal state of Dongye. Some scholars place Jinhan in the Han River valley, bounded by Mahan on the north and Byeonhan on the south. Byeonhan, also known as Byeonjin, refers to a loose confederacy of chiefdoms that existed from around the beginning of the Common Era to the fourth century in the southern Korean Peninsula. Byeonhan represented one of the Samhan (or "Three Hans"), along with Mahan and Jinhan. Byeonhan consisted of twelve statelets, that later gave rise to the Gaya confederacy, subsequently annexed by Silla, believed located in the south and west of the Nakdong River valley. Historians call the early part of the Three Kingdoms period the Proto-Three Kingdoms period. Byeonhan, like the other Samhan confederacies, appear to have descended from Jin state of southern Korea. Following the fall of Gojoseon and establishment of the Chinese commanderies in the northern part of the Korean Peninsula in 108 B.C.E., refugee migration and cultural transmission continued to transform the region. Archaeological evidence indicates an increase in military activity and weapons production among the Byeonhan in the third century, especially an increase in iron arrowheads and cuirasses. That may be associated with the decline of Byeonhan and the rise of the more centralized Gaya Confederacy, which most Byeonhan states joined. Silla, one of the Three Kingdoms of Korea subsequently annexed Gaya. The Chinese Records of Three Kingdoms present the language and culture of Byeonhan as essentially the same as Jinhan, and archaeological artifacts show little difference. Byeonhan may have simply referred to the chiefdoms in the south and west of the Nakdong River valley not formally members of the Jinhan confederacy. According to the third century Chinese chronicle Wei Zhi, Byeonhan earned reknown for the production of iron; it exported iron to the Chinese commanderies to the north, Yamato Japan and the rest of the Korean Peninsula. Byeonhan gained a reputation as a center of stoneware manufacture. Historians dispute the exact locations occupied by the different Samhan confederations. Most likely, their boundaries changed over time. Samguk Sagi indicates that Mahan occupied the northern region later became Goguryeo, Jinhan in the region later occupied by Silla, and Byeonhan in the southwestern region later occupied by Baekje. The earlier Chinese San guo zhi places Mahan in the southwest, Jinhan in the southeast, and Byeonhan between them. The Samhan villages usually hide deep in high mountain valleys, relatively secure from attack with mountain fortresses constructed as places of refuge during war. Historians and archaeologists believe that the minor states comprising the federations covered about as much land as a modern-day myeon, or township. Based on historical and archaeological records, river and sea routes appear to have been the primary means of long-distance transportation and trade. Jinhan and Byeonhan, with their coastal and river locations, became particularly prominent in international trade during that time. 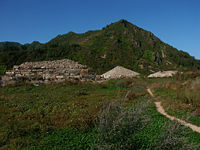 The Samhan saw the systematic introduction of iron into the southern Korean peninsula, taken up with particular intensity by the Byeonhan states of the Nakdong River valley. They manufactured and exported iron armor and weapons throughout Northeast Asia. The introduction of iron technology also facilitated growth in agriculture, as iron tools made the clearing and cultivation of land much easier. At this time the modern-day Jeolla area appears to have emerged as a center of rice production. Until the rise of Goguryeo, Samhan limited foreign relations largely to the Chinese commanderies located in the northern part of the peninsula. The longest standing of those, the Lelang commandery, appear to have maintained separate diplomatic relations with each individual state rather than with the heads of the confederacies as such. In the beginning, Shamhan maintained a tributary relationship was tributary: a political trading system in which China exchanged titles or prestige gifts for "tribute." Official seals identified each tribal leader's authority to trade with the commandery. After the fall of the Kingdom of Wei in the third century, San guo zhi reports that the Lelang commandery handed out official seals freely to local commoners, no longer symbolizing political authority. The Chinese commanderies also supplied luxury goods and consumed local products. Han dynasty coins and beads have been discovered throughout the Korean peninsula, exchanged for local iron or raw silk. After the second century C.E., as Chinese influence waned, iron ingots came into use as currency for the trade based around Jinhan and Byeonhan. Trade relations also existed with the emergent states of Japan at that time, most commonly involving the exchange of ornamental Japanese bronzeware for Korean iron. Those trade relations shifted in the third century, when the Yamatai federation of Kyūshū gained monopolistic control over Japanese trade with Byeonhan. Barnes, G.L. 2000. Archaeological armor in Korea and Japan: Styles, technology and social setting. Journal of East Asian Archeology 2 (3–4), 61–96. Kim, J.B. 1974. Characteristics of Mahan in ancient Korean society. Korea Journal 14(6), 4-10. Yi, H.H. 2001. International trade system in East Asia from the first to the fourth century. Korea Journal 41(4), 239-268. This page was last modified on 13 August 2015, at 16:24.